Whether you're a experienced travel agent or a "newbie," joining our family will be one of the easiest decisions of your life. What's so great about us? We give you the tools to succeed! Many host agencies out there create a factory-like environment between themselves and their agents. Since we're a family-owned and operated business, we take great pride in having a professional, yet personable, working environment. Our staff will go out of their way to make sure that you have the best training possible, and that you feel right at home with us! ♦ Making your own hours! ♦ Our experienced, expert agent trainers, that help ensure your success! 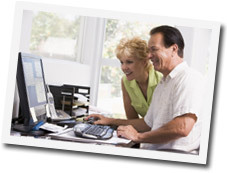 ♦ Access to our secure invoicing and client-database system, from your home! ♦ Coverage in our Errors & Omissions Insurance policy! ♦ Complimentary marketing flyer design services. ♦ Special "travel agent only" pricing, as well as special travel opportunities. ♦ Membership in respected organizations, such as CLIA and IATAN. ♦ The credibility of being affiliated with a well-respected and high producing travel agency. We do have a great training program in place, with options available for people of all experience levels in the travel industry (or for those with no experience). Whether you're looking for in-person training or training via webinars, there's sure to be an option we have that's perfect for you! Start a new, exciting career! You can do this full-time, part-time, or just whenever you have the time. Selling cruises from home with us is easy! For additional details check out our home based travel agent program, view our brochure, or contact us today. You'll be starting your home based travel business, and selling cruises and tours, before you know it!